"They either absolutely break you, or you get out"
This book exposes a secretive group which has hidden within the Presbyterian and (until recently) Anglican churches in Melbourne since the 1930s. This is the first time the leaders have been exposed, and the damage wrought to hundreds of ex-members and others brought to light. But Fractured Families does more than reveal tragically broken lives. It is a warning to all churches of the far-reaching and destructive repercussions of false teaching - however subtle, however sincere - in their midst. And it is an attempt to bring validation and closure to those who remain victims of the cult. 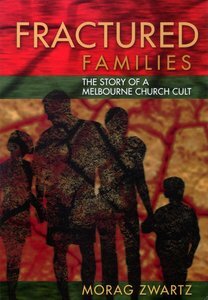 About "Fractured Families: The Story of a Melbourne Church Cult"
Morag Zwartz is a Melbourne journalist who has written Fractured Families, The New Age Gospel: Christ or Counterfeit ? and most recently Apostles of Fear: A Church Cult Exposed.